Can Dogs Eat Avocado? Find Out Now! Avocados are a delicious and healthy snack for humans. They’re packed with protein, fiber, healthy fats, and vitamins A, C, and E. All those benefits must mean it’s okay to share a nibble your pup, right? Unfortunately, no. Despite all of the ways that avocados benefit humans, they pose a risk for your dog, and it’s best to avoid them altogether — especially when there are so many safe treats your furry pal can enjoy! Related: Can Dogs Eat Bananas? Better Make It A Split! Always ask your vet before you add any new foods to your dog's diet. Generally, there are two main reasons that you need to keep the guac to yourself. First up — avocados contain a toxin called persin which can cause vomiting and diarrhea in dogs. Persin is harmless to humans, but can be fatal if ingested by birds, fish, cattle, and rodents. Dogs and cats can handle the toxin better than other animals, but it doesn’t exactly sound like something you want your doggo snacking on, does it? Persin is most concentrated in the leaves and bark of an avocado tree, but is also in the skin, fruit, and pit of the avocado. Which brings us to the more obvious avocado danger — the pit. Not only is an avocado pit chock-full of persin, but it’s also a choking hazard. The large, round pit could easily get stuck in your dog’s esophagus, stomach, or intestinal tract which is a serious (and costly) health issue. Can Dogs Eat Avocado … Just A Little Bit? 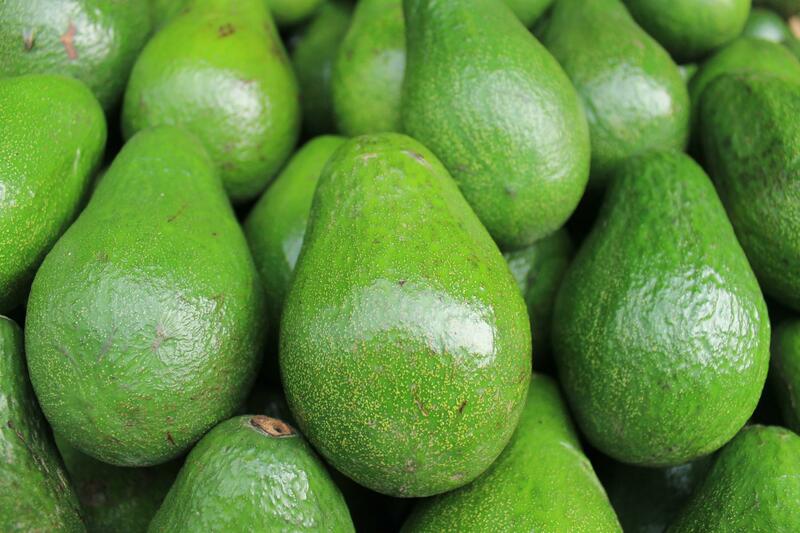 Some pet associations, like the ASPCA, argue that in moderation, the fruit of ripe avocados is perfectly safe for dogs. Although uncommon, avocado meal or oil is even used in specialty brands of dog food. But when it comes to the health of our pups, we like to err on the side of safety. Don’t go into a full blown panic mode if Duke licks a dribble of guacamole off your shoe, just be sure to tell guests and family members to fully dispose of avocado shells and pits. And if your pet is especially determined, make sure your garbage is securely shut! If you’re interested in the health benefits of avocados, consult your vet to find supplements or agree on a completely safe food to supplement your pet’s diet. Dogs And Avocados? Paws Off! We think of our dogs as members of the family, and it’s all too easy to get in the habit of sharing food with your furbaby. It’s hard to remember which foods are safe, which are ok in moderation, and which are totally off limits for your pet. That’s why we write about the topic so often! Thank you for being a responsible pet owner! What other foods do you wonder about feeding your pooch? Let us know in the comments!